How about a little protest with your Monday night football? In the wake of the Ray Rice domestic violence case and ensuing PR disaster, the NFL season is off to an unpleasant start — and don't expect it to ease up anytime soon. A new Twitter campaign is demanding commissioner Roger Goodell's resignation via the hashtag #GoodellMustGo. Over the weekend, women's rights group UltraViolet took this haghtag to the skies, flying #GoodellMustGo banners over three pro football stadiums. The group plans to fly one over Monday night's Indianapolis Colts-Philadelphia Eagles game in Indianapolis. Pressure continues to mount against the NFL commissioner, who initially handed former Baltimore Ravens player Ray Rice a two-game suspension for his assault against his now-wife Janay Palmer in an Atlantic City casino elevator. Goodell claims he didn't see the full video of the assault until it was released last Monday through TMZ, but apparently did know that Rice rendered Palmer unconscious with one punch to the head. Calls for Goodell's resignation for his mishandling of the case have largely been coming from women's rights groups, who believe the NFL needs to be accountable for domestic violence among its ranks. On Wednesday, National Organization for Women President Terry O'Neill said in a statement that the "only workable solution" is for Goodell to resign. "New leadership must come in with a specific charge to transform the culture of violence against women that pervades the NFL," O'Neill said. Now, UltraViolet is taking the resignation demands to the stadium. The #GoodellMustGo banners flew over pro football games in New Jersey, Cleveland and San Francisco on Sunday, drawing attention away from the field. The group also created a petition calling for Goodell's resignation, with more than 15,000 signatures as of Monday. 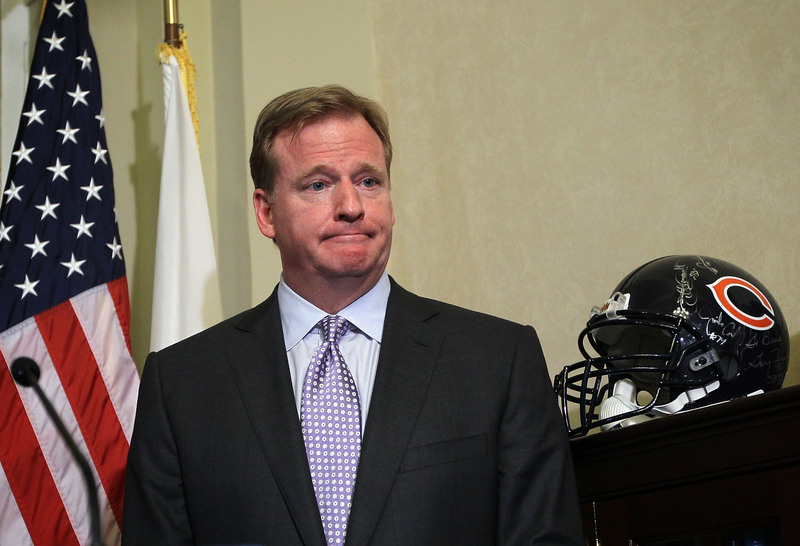 In the meantime, pro football fans continue to tweet their calls for Goodell's resignation. It is time for Roger Goodell to resign, and for the NFL to get serious about its commitment to ending violence against women within the league. In a country where a woman is battered every 9 seconds and 1 in 4 women experience domestic violence in their lifetime, we simply cannot afford to have an NFL commissioner who doesn’t take this issue seriously. But it's not just the NFL that's taking the heat. On Saturday, a disturbing image spread across Twitter through the #GoodellMustGo hashtag, urging people to boycott CoverGirl, which has a special NFL makeup line. The photoshopped image altered the ad for the company's NFL-themed cosmetics — which has the slogan, "Get your game face on!" — turning the purple eyeshadow into a black eye. CoverGirl has yet to respond to the image. The embattled NFL commissioner is currently maintaining a low profile, failing to show up to his scheduled appearance at Sunday's 49ers game in San Francisco.